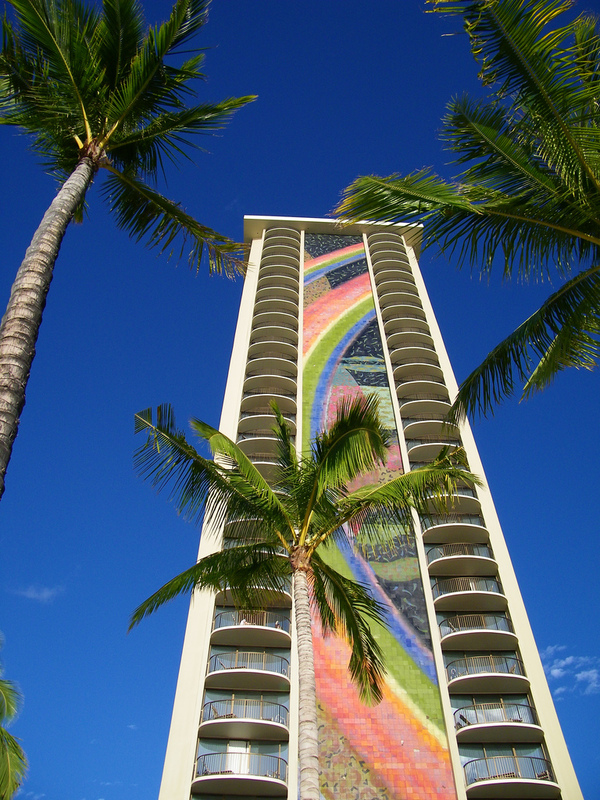 Hilton Rainbow Tower, Honolulu, Millard Sheets Interpace ceramic mural, 1968. Photo via Flickr Creative Commons by coconut wireless, 2008. Ahmanson and Sheets were both large personalities, and their working relationship was full of both trust and, at times, disagreement. But this resignation was less about that than another opportunity for Sheets: to become corporate design advisor for Interpace, the successor company to California ceramics leader Gladding, McBean & Company. Millard Sheets thought of painting as his true passion–watercolors, mostly, and things that could fit on an easel. But in 1953, his frescoes, murals, interior design and architectural work had garnered Howard Ahmanson’s attention, and Sheets found himself at the head of a studio doing remarkable architectural, mosaic, painting, and stained glass work–making him even more prominent, though taking him away from the painting. So in 1963 he sought to resign, and dedicate his efforts to a new venture: managing artists-in-residence designing ceramics, with uses from dinnerware to household decoration to large-scale architectural works. As the recent American Museum of Ceramic Art show and essays by Hal Nelson, James Elliot-Bishop, and others describe its wonderful catalog, Common Ground: Ceramics in Southern California, 1945-1975, explain, Sheets had highlighted these uses in his Arts of Daily Living show at the LA County Fair and in the resulting House Beautiful special edition, where the work was praised by Frank Lloyd Wright as a continuation of his ideals. Sheets hired Harrison McIntosh, Rupert Deese, Francis Chun, Dora De Larios, and others to hep design the work. In memos, Sheets discussed the possibility of asking a remarkable range of artists to participate, naming Pablo Picasso, Marc Chagall, Salvador Dali, Henry Moore, Alexander Calder, Andrew Wyeth, David Alfaro Siquieros, Andy Warhol, Robert Rauschenberg, Francis Bacon, Willem De Kooning, Roy Lichtenstein, Jasper Johns, Joan Miro, and Stuart Davis as artists to approach. To approach such artists for avant-garde designs for commercial ceramics demonstrates how Sheets, ever at the intersection of fine arts and commercial applications, foresaw the kinds of top-designers-for-Target/Walmart/etc. blurring of categories we experience today. 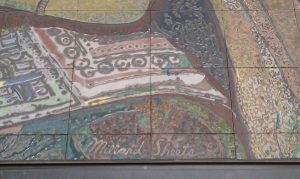 To Sheets, it must have seemed like a perfect marriage of traditional arts, top design, and commercial applications, as these tiles were uniform, mass-produced yet hand-colored, and perfectly suited for anything from a home wall accent to the massive projects they accomplished. This flexibility and modularity seems to fulfill some of what Frank Lloyd Wright had attempted with his textile-block designs, such as the Alice Millard House in Pasadena and the Ennis House in Los Angeles. 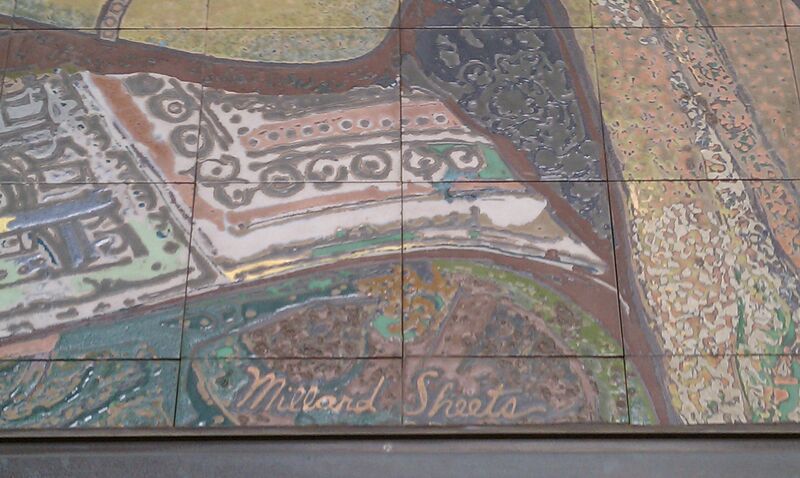 Millard Sheets, Nancy Colbath, Sue Hertel, Millie Horlach, Sheridan Stanton and Mildred Downing, Los Angeles City Hall East ceramic-tile mural, detail, 1972. This time, with his house in Gualala completed and work for Home Savings, Interpace, and others in good hands, Sheets mostly succeeded, but he kept a hand in these large-scale public artworks as well. And despite Sheets’s interest in emphasizing his paintings, these works of art and architecture seem destined to be an important part of his legacy of art as well. hi Adam, do you know the date during which Sheets was brought on with Interpace, and if he had had any direct contact with Gladding/McBean before their transition? thank you. The resignation letter and a contract with Interpace were simultaneous in September 1963 – but, as I note, Sheets also continues working for Home Savings. The files show a connection to Interpace/Gladding,McBean at least as far back as 1961, but Sheets seems very familiar with them, and would have had earlier connections through the Claremont circle.